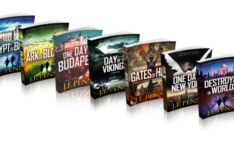 With 28 published books Joanna Penn is prolific by most standards. Her print books, however, are just the beginning – those 17 novels and nine non-fiction books by three author names are the foundation for 110 e-book and audio products; that’s dwarfed further by her 1,300 blog posts, 360 podcasts, 500 videos, a handful of short stories, and a side-line writing sweet romance with her Mum. All of this has been achieved in 10 years – the time researchers reckon it takes to master a skill. So how does this New York Times bestselling author manage it? Above Joanna Penn’s desk is a sign that says: “Create a body of work I’m proud of.” This goal drives her approach to writing – a deliberate focus on mastery which involves both increasing her output and improving her craft. Penn launched her website, The Creative Penn, in 2008 and the following year she started a podcast of the same name. Everything she writes, produces and records is about becoming a better writer and she’s held accountable by sharing her writing journey with hundreds of thousands of fans. We’re going to dig into Penn’s advice on these three areas and share her personal productivity hacks and stories from her writing life. But before we do that let’s delve into her backstory. Nowadays, Penn might be the happiest writer around – her laugher rings throughout her podcasts and videos – but once upon a time she was deeply miserable. And that misery was what got her writing. She believes that feeling miserable forced her to evaluate what matters and to prioritise what made her happy. Her advice to others who tell her they want to write? Feel the pain! And that brings us to her first piece of writing advice: find your why. That’s exactly what she did. Penn’s ‘why’ started with her desire to leave her horrible job, and over the last decade her why evolved as she built a body of work and a business from her writing. Penn describes herself as a “goal junkie”. Each year she shares her annual goals on her blog and podcast and reviews how the previous year stacked up. Having written goals and sharing them publicly are proven accountability tactics. Research shows that people who write down their goals are more likely to achieve them; and those who share their goals with a friend have even more success. Her goals for 2018 are a combination of output and improving her craft, in particular, a focus on storytelling. She’s investing in her skills now so she can continue to tell stories for the rest of her life. “I would like to be an award-winning author, but that to me is not a goal. The only way I can work towards that goal is to become a better story teller. So, in terms of working towards that goal, it’s about scheduling courses and improving my craft, and writing more stories and entering them into awards. She takes a very active approach to blocking time to write – looking across a year, a month and each day. Penn’s daily schedule provides clarity on her priorities by putting her creative writing as her primary goal each day. 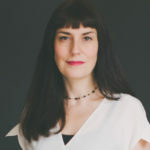 She also has some classic work-life balance goals: Penn blocks time for exercise – she practises yoga every day and is training for a 104 kilometre walk around the Isle of Wight – and sets aside time to learn, and to have a break. “Time blocking is the most important thing and as I said, I have a recurring time block to do first draft stuff, I have recurring time block for yoga and walking and then I have recurring time blocks for learning. I schedule time to read screenplays or do an online course or I go on a lot of courses. “I’m scheduling my whole year now. I’m already scheduling breaks, which is very important because I really work too hard. This summer, for the first time since 2009, I’m going take three weeks off the podcast. And then I’m going do it again in December. Being a prolific writer like Penn does not mean compromising your health. Her latest non-fiction book is called The Healthy Writer, and in it she outlines practical tips and inspiring case studies for ensuring an active body and a healthy approach to food. 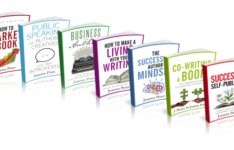 Joanna Penn is a successful, prolific, self-made author entrepreneur, who finds time to stay healthy and happy. There is much we can learn from her, starting with ‘why’ we write, getting clarity on our goals, and setting aside time to make it happen. Writing is important to Penn – it’s what drives her and her business – but it’s only one part of leading fulfilling well-balanced life, and that’s the goal we should all aim for.